When Dippy came to Dorset, it was a record-breaking hit. So, when the Dorset Tourism Awards season was upon us, we certainly knew the diplodocus’ 12-week stay would be back to steal the show. Today we’re raising a (large!) glass and sending huge cheers to the super team at Dorset County Museum for being crowned winners of not one but two awards at last night’s ceremony. 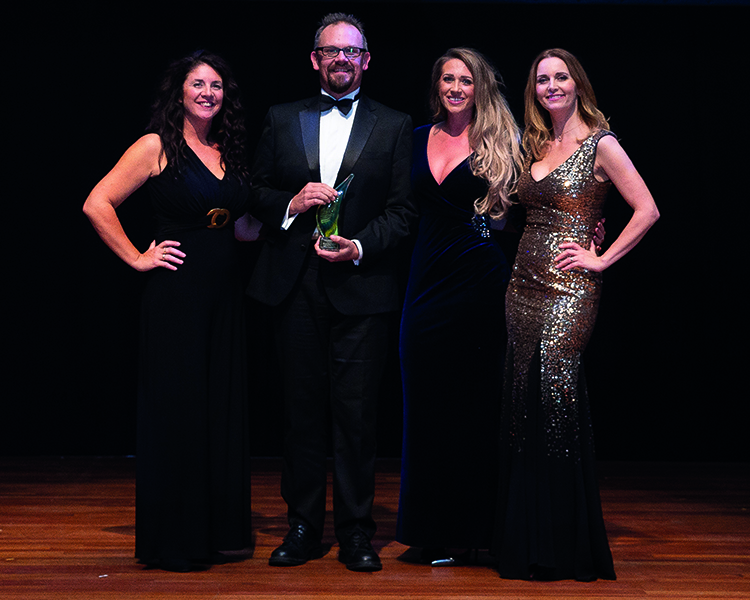 Awarded Tourism Event of the Year 2018 and Outstanding Contribution to Dorset Tourism 2018 with the Jurassic Coast Trust these awards are a true testament to the phenomenal success of their rather popular and loveable guest. Always a delight to work with the Museum team, we enjoyed every minute helping to bring Dippy here to Dorset for the tens of thousands to see, and we couldn’t be prouder in the Studio to be part of such an unforgettable project. The awards come just after the marvellous McCarthy & Stone add to their collection of outstanding awards, winning Best Retirement Scheme at the Housebuilder Awards for their Horizon’s development in Poole last week. Designing the submission for the awards, our beaming faces say it all!